'In Limbo' is possibly the best way to describe how I'm feeling right now. I'm torn between revising for the rapidly dwindling number of exams I have left, or just shunning my exercise books and writing. On top of this quandary, I have been struck down with general un-wellness (alongside a sore throat and ear ache - there's a side ordering of tinnitus). The simple pleasures of pitching a tent next to a mumbling river, meeting new people and wandering along forest-framed footpaths are unbeatable. As is scrambling over rocks to read the Guardian Weekend in the middle of the racing water. Oh and playing in the sea with my brother and his new found friends - by that I mean I was the 'shark' that they all wanted to splash and squeal at. We took part in every camping cliche that could be mustered - singing Beatles' songs around the campfire, toasting marshmallows on sharpened twigs and plunging into the ice-lolly cold river. I can think of worse ways to wake oneself up. The added no mobile phone signal starts to make this post sound like the stories you read in a Sunday supplement travel section; where the writer 'reconnected' with the bucolic force of nature and realised that actually twitter/ facebook/ emails aren't that important, and should be replaced with gardening and willow plaiting. My daily bond with the outdoors is still as strong as ever (hard not to be, as I am writing this while looking out at fields and trees), but there was something magical about just being in and appreciating such a lush, green environment. So, green is the word of the day - as it has figured both in this outfit, and in my thoughts. The colour green can be seen to symbolise many different things. After watching Atonement for the 57th time last night, I was reminded of a quote about that green silk dress worn by Keira Knightley, about which the designer Jacqueline Durran claimed that the particular shade had been chosen to represent temptation. It could also be seen as an embodiment of Briony's envy, or as the Guardian suggested, a "leitmotif" repeated throughout the film. Although I'm sure a whole essay could be written on the various merits and motives of that swoon-worthy bias cut dress (the psychology of clothes - utterly fascinating); what I'm talking about specifically is the power of colour. As well as the above attributes, green can symbolise jealousy and evil - making it a ripe choice for the Witch in the 'Wizard of Oz'. However, it is also a shade that can stand for qualities such as environmental, natural, wild and cyclical - just think of the 'Green Man' within british folklore. All these conflicting messages associated with just one element of the colour spectrum! However, the same can be said of all the colours we are surrounded by. Red can be danger, confidence or symbolic of the 'vamp'. Black can remind one of the epitome of elegance - Audrey Hepburn in her rollneck jumper and capri pants - or represent morbidity and death. White can be either purity and chastity, or it can exemplify minimalism. It's all so dependent on context. In this instance, the colour of the dress is just one of the many shades of green that inked in my idyllic weekend - just another simple pleasure. Down to the details. The vintage dress was a birthday present, as were the gorgeous Office shoes (from ebay I am told). 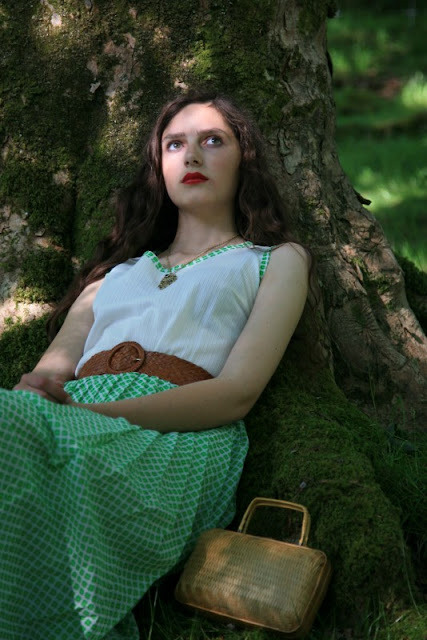 The little basket bag was picked up in a charity shop, along with the leather belt. The necklace belonged to my great-grandma. Great skirt, I love all of it! Roz, I really admire the way that you can tell stories in your posts which just seem to effortlessly flow. Considering it is only the last two lines of this post that discuss your outfit (loving these new heels of yours by the way, especially admiring your ability to actually walk in them!) you have a gift for someone who would be described predominantly as a fashion blogger. Atonement has been sitting unwatched and still in its cellophane on my shelf for two years as I haven't yet manage to coerce any of my family into watching it with me! I suppose now I should be resolved to the fact that I never will either and will have to watch it alone! You describe that sense of freedom and release felt in the countryside so well - phones especially, I find are culprits of constantly interrupting our lives to keep us up to date, and although I am never without mine it makes me feel a little sad inside that modern living has gotten to such a stage where we all need to be available 24/7 - as if it is a crime to escape from the noise for a little while and appreciate the silence and beauty of the natural world. And you've made me want to go camping now. Good luck with your exams. I would say do at least a little work, to keep the panic down. Green is pretty much my favourite colour, always epitomised for me by that scene in the bamboo forest in Crouching Tiger Hidden Dragon. So gorgeous. Adore all the hues of green (with the background scenery as well!) and that dress is a remarkable birthday present! such a pretty setting and your shoes are amazing!! 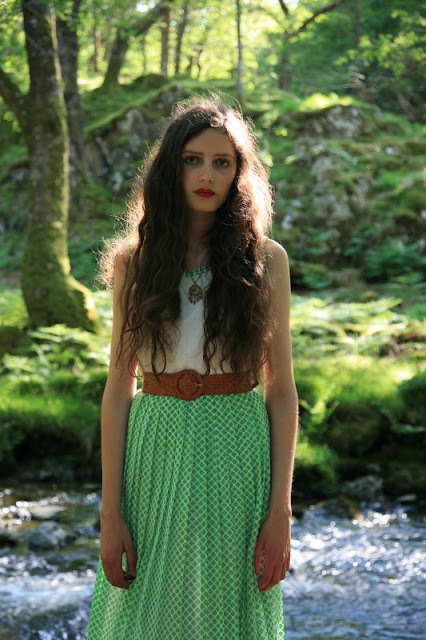 Lovely green outfit, and the Welsh country side is just idyllic! I was just having a discussion with another blogger about the symbolism of colors in clothes (and how convention prevents me from wearing white/ivory as a wedding guest). Hope you feel better soon. It's my turn for a camping trip next weekend somewhere in the area of Yosemite! Goodness, you look so beautiful! I love the long length of the skirt, and the green is so vibrant and goes with the colour of your hair perfectly! I love the third to last picture, the lighting, your posture, your outfit, it all seems so perfect! You seem to have had such a wonderful time camping, and you made it sound so effortless and elegant! I'm going camping this week and the weather report is not good! Good luck for your exams, I can not wait until your next post! aaa i love this dress is so nice in the woods !! This camping trip sounds perfect. And "in limbo" describes my current situation too. This state is unnerving, isn't it? Roz, as always your photographs are inspiring, you manage to capture a certain mood and intensity in your images that is quite breathtaking. It sounds like you had a lovely holiday! I am partial to a bit of Wales myself, although not the camping so much. your outfit perfectly captures what the text issaying :) love that dress/ that color green! as in how marvelous the pleats and the polka dots look in the shyest of green, that pale cucumber of promise of a skirt you're wearing. Lovely as ever dear friend. Good luck on your exams and here's to wishing you a fantastic summer! Lovely feminine, vintage style dress. What a pretty skirt..I have a similar one that's pink. Picture two and four are superb! love the outfit, good luck in your exams! OMG!! what a skirt!! Love it, also pictures are stunning! This outfit is SO beautiful, along with you! I love these photos, they're very pretty. I'm following your blog! Hey I loved ur Blog! It's beautiful & this green outfit is gorgeous! Keep up the good work! Following you now! Follow me back! Thanks! your trip sounds so invigorating. I feel the same way when I take a trip out to the countryside (to my bf's house in the middle of nowhere) and just play with the pets, go fishing, go walking along the cow-speckled pasture, etc. Anyway, I stumbled on your blog via Annika's and you're so gorgeous with such a lovely vintage-esque style! I will be stopping by more. Love the sheer maxi! You are beautiful, and your hair is stunning. Love it. These pictures are gorgeous. I love the third one down; you look stunning. I love "Atonement." I recently bought the book but haven't read it yet. Wonderful!!! Who took that pictures? Ohmygosh... the 2nd and last photo of you are just STUNNING!! I love the pose. Your such a natural model, Roz. Both your dress and your camping trip are pretty much perfect. I love the colour green, so etheral and dreamy. i love your dress, and you pose very well...it's always funny to see egoblogs, somepeople really should relax and enjoy, and looks like you're seriously having such a great time! Quite a leBon style you have...I like it! I go away for 5 days away from internet, and you appear like in a magical dream. I can't remember if I commented. BUT I love this outfit. I think the green skirt is just so perfect, or is it a dress...anyways, I think it's such a gorgeous outfit. You really need to go into modelling. THese could be in a magazine. First, hope you're feeling better! (and your mum btw). Each post you do I think 'this is the ultimate, it's perfection' but really, if I had to choose Roz's perfect post, this has got to be it. (It's funny, Ruta, the comment above mine, used the word perfect, too). Uncanny that you wrote that about Atonement: I loved the film, too - each actor/actress were perfectly cast and my favourite British actors, especially Kiera Knightly and James McAvoy - but also, in the book, which I read after, he specifically talks about that green dress - 'cut on the bias'. So they were being faithful to the story. I've also noticed other novelists specifically talking about green dresses. Charles.. blanking on his name, in The Graduate. And he was a very lean writer, he hardly used any description, but he mentioned green dresses several times. This pattern is the exact colour of a cotton culotte mini skirt dress - a kind of clean lined 'romper' - that I chose for my going away to summer camp when I was 12. I'll try to find the photo and scan/send it - I might even do a post, inspired by this. Because it's true: I've also been in a kind of fashion limbo recently - the clothes I expected to wear are wrong for this weather. I'm not seeing much on the street that's exciting, obviously: everything is black and grey and rain gear: not a colour block or tropical print or even short shorts in sight. Great dress!! Perfect shape and color!! You look gorgeous! I had exactly that camping trip two weeks ago. It was heaven. And I love the dress in Atonement, even though green is NOT my color. At all. green represents the 4th chakra, the heart chakra. pretty dress. i am a reiki master and work with colors and chakras.